Automotive, Truck, Commercial, Aeronautical, & Nautical. 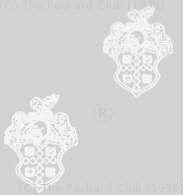 Please update to a newer browser and enjoy all of the features of The Packard Club website. A free browser is available at either www.netscape.com or www.microsoft.com, depending upon your operating system. Contact your Internet Service Provider for other options and installation assistance. At a minimum, you will need Netscape or MS Internet Explorer version 4 or higher and you'll need to enable Java, Java Script and Cookies in your Browser's perferences.